Have your company "drop the anchor" at your tradeshow booth and show off the Medium Classic Boat Bag! The imported boat bag is constructed in heavyweight 18 oz. canvas making this item a must-have. 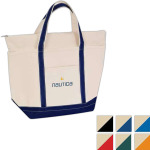 The product features an outside open pocket, natural zipper top and is available in a variety of accent color options to choose from. Add a zipper top, inside pocket or drop-in lining to make this bag complete! Size: 20" x 12.5" x 7.5". I'm interested in learning about the Medium Classic Boat Bag. Please contact me.